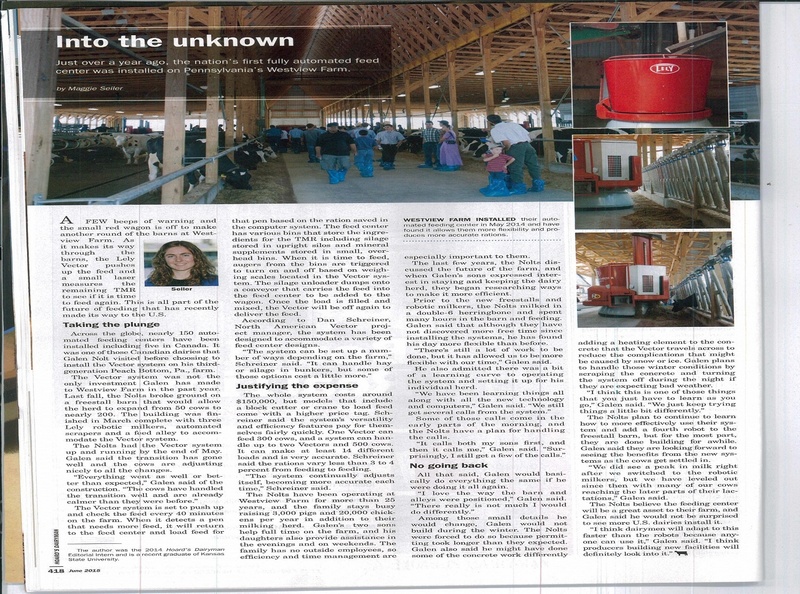 In the June issue of Hoard's Dairyman, writer Maggie Seiler features Galen Nolt and Westview Farms in Peach Bottom, PA, for having operated a Lely Vector for one year. Read this excerpt below or the entire article is on page 418 of the June 2015 issue. The Nolts had the Vector system up and running by the end of May (last year). Galen said the transition has gone well and the cows are adjusting nicely to all the changes. "Everything went well or better than expected," Galen said of the construction. "The cows have handled the transition well and are already calmer than they were before." "The Vector system is set to push up and check the feed every 40 minutes on the farm. When it detects a pen that needs more feed, it will return to the feed center and load feed for that pen based on the ration saved in the computer system. The feed center has various bins that store the ingredients for the TMR including silage stored in upright silos and mineral supplements store in small, overhead bins. When it is time to feed, augers from the bins are triggered to turn on and off based on weighing scales located in the Vector system. The silage unloader dumps onto a conveyor that carries the feed into the feed center to be added to the wagon. Once the load is filled and mixed, the Vector will be off again to deliver the feed."